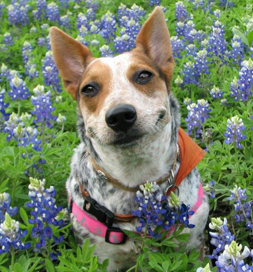 Middy poses in a field of bluebonnets. When she arrived at the shelter to meet Middy, then called Jezebel, the staff related how the dog had been abused–left outside in 100 degree heat and beaten with a hose and belts by the men in the family with whom she lived. That was over three years ago. Middy’s recovery from her mistreatment has required the Amundson’s patience, but they have experienced the joy of watching her open up as she has learned to trust people. The healing continues. She is still leery of men she doesn’t know but eagerly greets people she does know and offers them her toys. She loves to sit with Julie and her husband on their screened porch, where she assumes the job of squirrel patrol. “She chases them out of our yard and my garden,” Julie says. A good home, a loving family, a job to do—what’s more perfect for a little dog who had such a deplorable start in life.